Hi, there. This is the "Happy New Year" page. 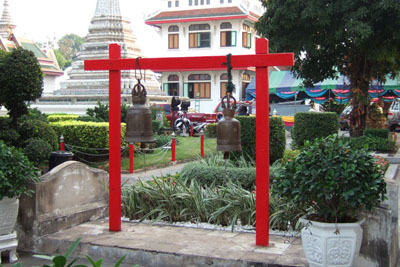 The scenery related to New Year's Day in Thailand is shown here. Talking about "New Year's Day" in Thailand, they have three occasions; the beginning of the year, Chinese New Year in February, and the famous Songkran Festival (also famous for another name " Water Festival ".) that is held from 13th to 15 in April (the hottest season in Thailand). Visit to a temple to pray. 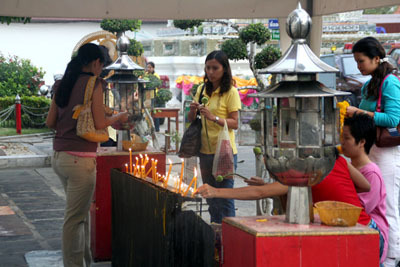 You'll see offerings for monks and incense sticks. In Japan, people enjoy new year's holiday from the end of the year to around the 3rd day or the end of the first week of the year. 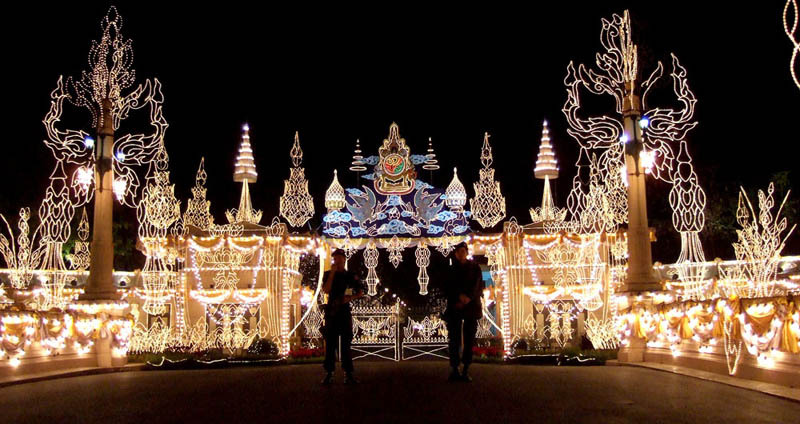 However in Thailand, they have only 3 day long holiday from the 31th in December to the second of January. After that, normal everyday comes back. On 31th in December, families including their relatives gather and enjoy chatting and having dinner, and a special year-end countdown is held. 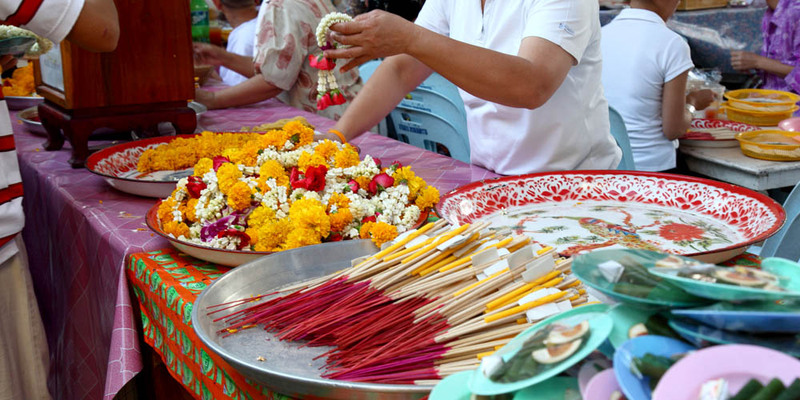 And on the first day of the year, people visit temples to do " Tamboon " (offering something to monks or temples such as food; people in Thailand who believe in reincarnation do Tamboon (do good things) and accumulate virtues for happiness of their next lives) in the very early morning. This page shows the scenery of the year, 2007. 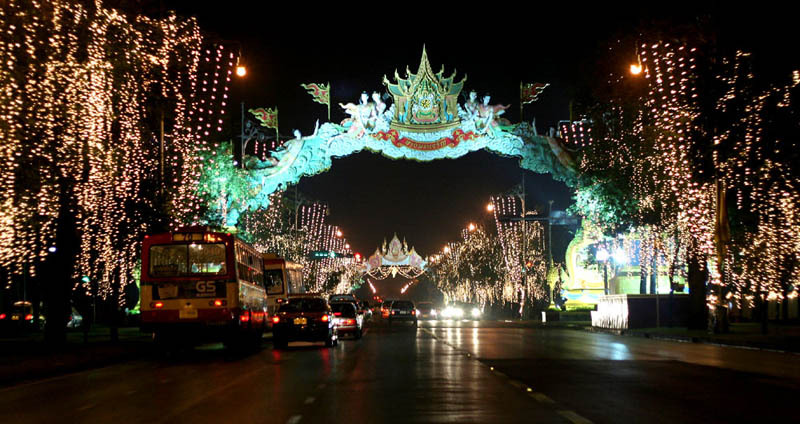 The scenery of a street of the end or the beginning of the year before dawn in Bangkok. 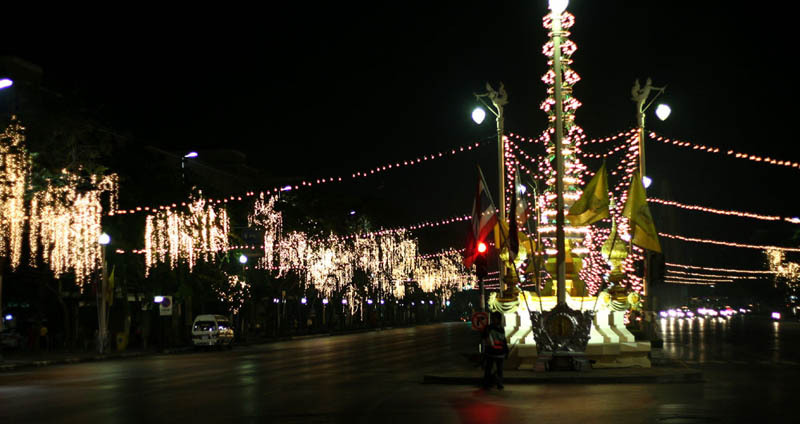 The scenery of the street of the end or the beginning of the year before dawn in Bangkok. 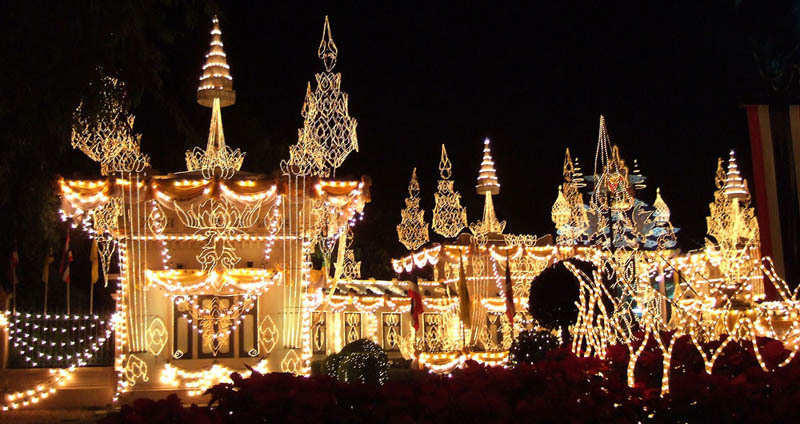 Wonderfully decorated with a lot of lights. 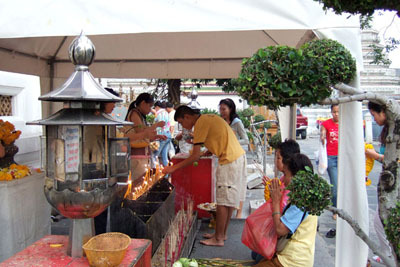 People can be seen here and there who have offerings for Tamboon. 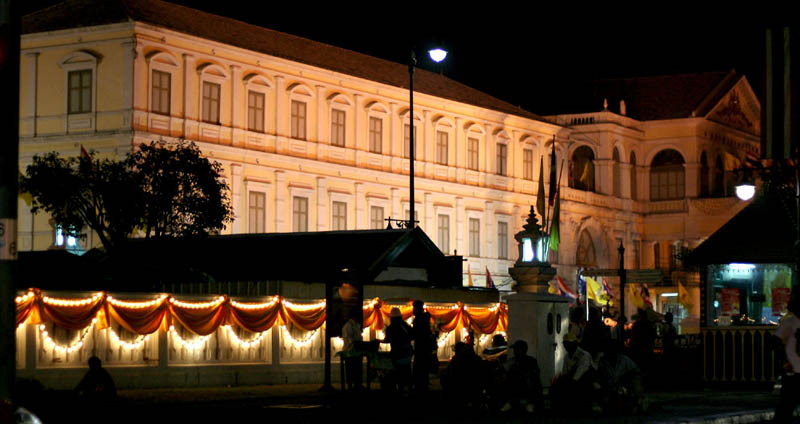 The royal residence of the King in Bangkok. Like the 60th anniversary, it looks splendid. I guess this is a special office (Army ministry ?). Some people are waiting for the offering around here. This street is also wonderfully decorated with a lot of lights. This is the temple, Wat Benchamabophit (The Marble Temple) before dawn in Bangkok. 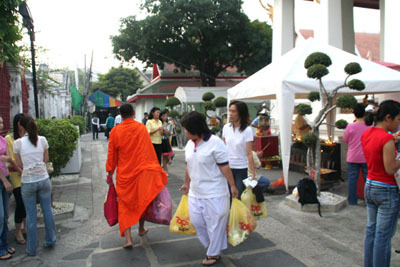 We prepared a lot of rice, cans of fruit, water, juice and so on for "Tamboon" (offerings) and visited here. 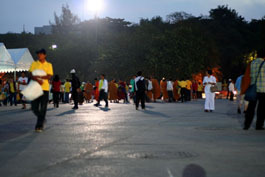 Monks already came out from the temple and people were doing "Tamboon" around the area. People are doing Tamboon. 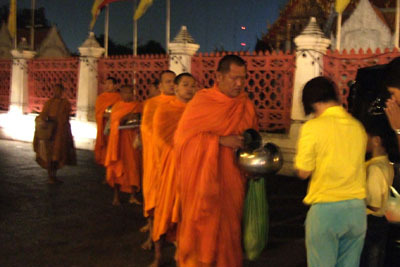 Monks are in the line. They are having containers called "baht" to put the offerings. 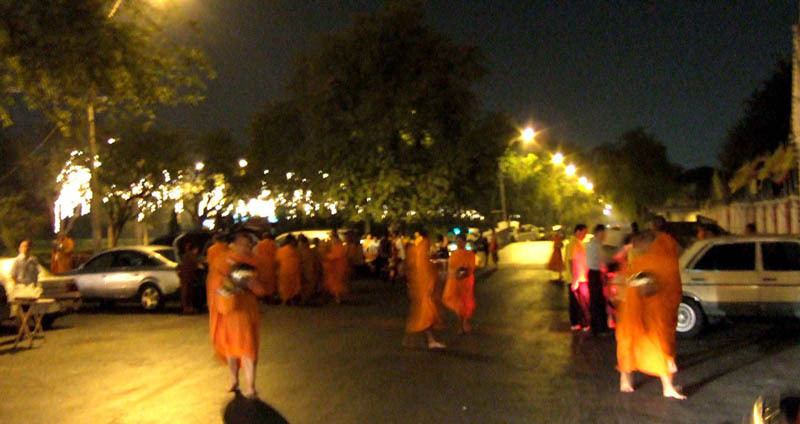 A lot of monks are in the line. 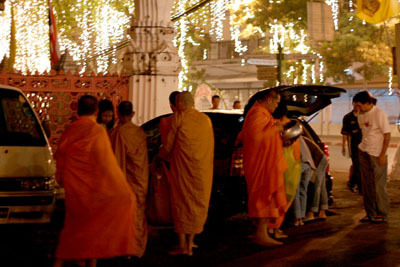 People are doing Tamboon with what they prepared for the monks, putting out from the car. 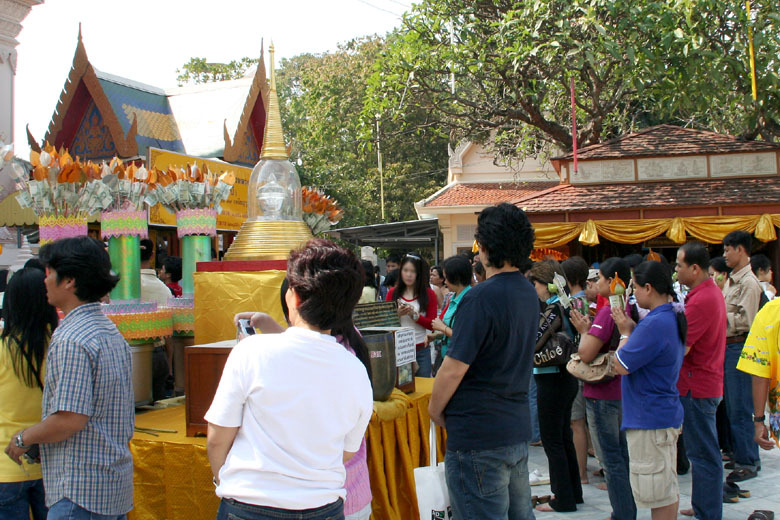 Scenery of New Year's Day in Sanam Luang around the Grand Palace in Bangkok. This place is crowded as well with a lot of people (monks and ordinary people), and a new year's ceremony is taken place. Sanam Luang is called Phra Mane Ground or Thung Phra Meru as well. 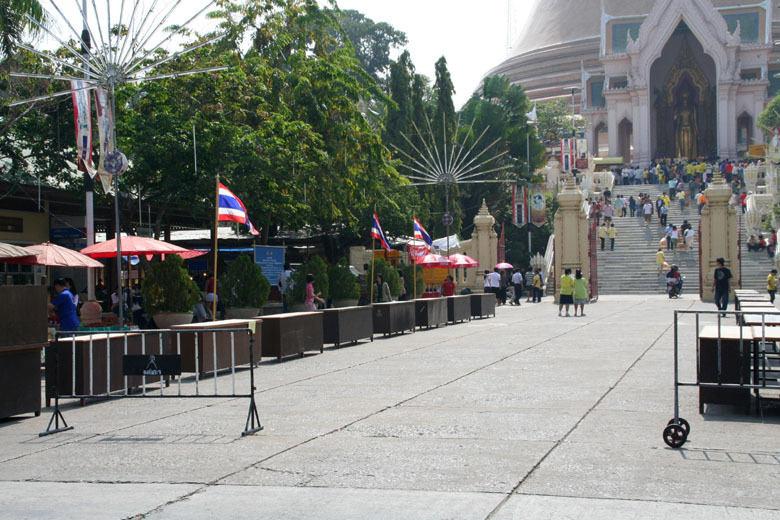 It's a vast open place next to the Grand Palace. 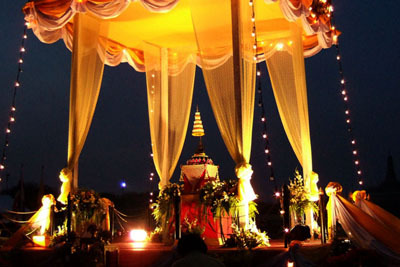 It has been the place where ceremonies are held for birthdays of kings and queens or for other important days, including for the cremation of royal family, since the reign of King Rama I.
I hear that it's a main place of traditional Thai kite flying from late February till around April or May. Let's go and see what it looks like. They've prepared for the ceremony with many tents set up. Very wide place. A lot of monks and ordinary people in this place from the very early morning. 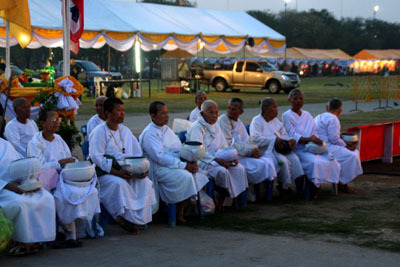 Monks are having containers called "baht" for offerings. They have shoulder belts. 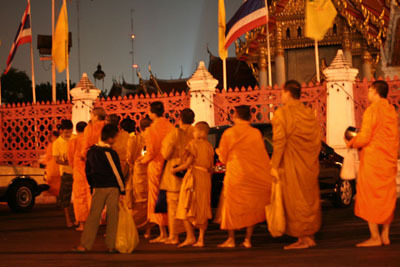 Women monks are in the lines and a new year ceremony are held. 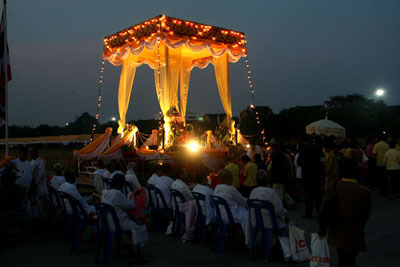 An altar called "Param" is set up. A little difficult to find in the picture but a small famous monk image is put around the top in the decoration. A Buddha image is in front of the altar, and people put gold leaf over it. Another angle of the front of the altar. People light candles and pray. The side of the altar. Women monks in white are in the lines. 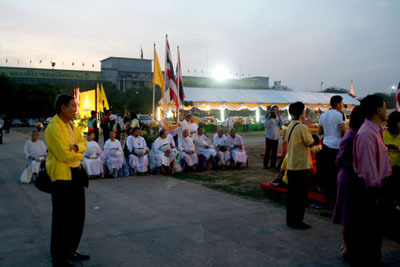 The female monks in white are having white containers (called baht), different from male monks. 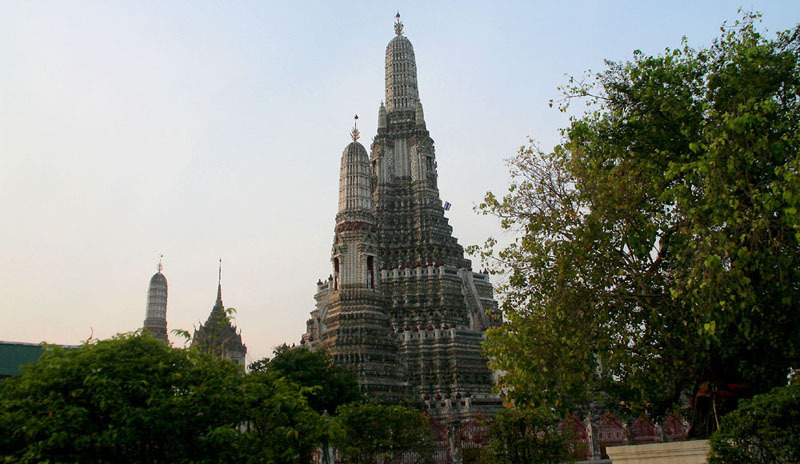 As you maybe know, this is Wat Arun, also known as "Temple of the Dawn" in Bangkok, that is said that the temple is the most beautiful at dawn. This place also is crowded with a lot of people from the early morning. 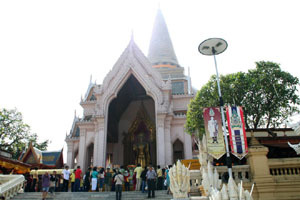 I visited here around dawn, but I guess it was better to see from the opposite side of Chao Phraya River that is running in front of the temple. 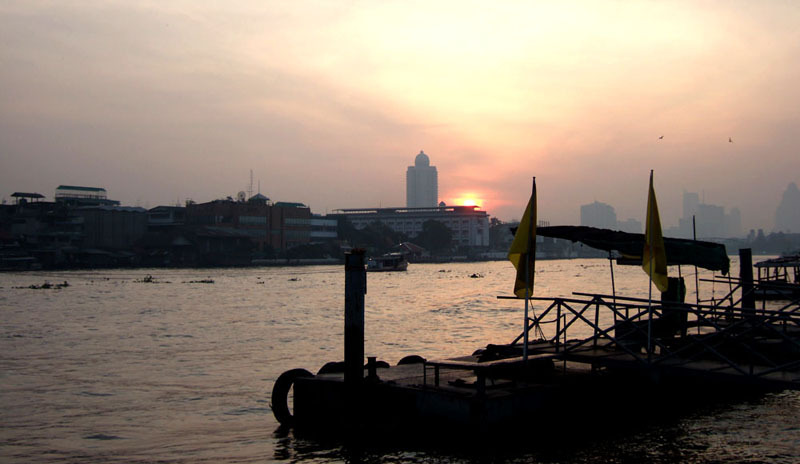 The scenery of sunrise from Chao Phraya River in front of Wat Arun. 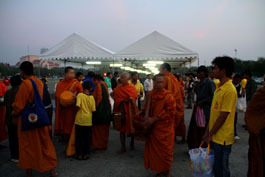 People having offerings for Tamboon come and go. 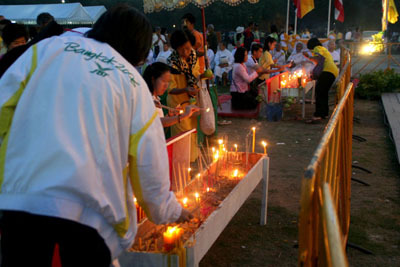 People are praying with candles and sticks of incense. 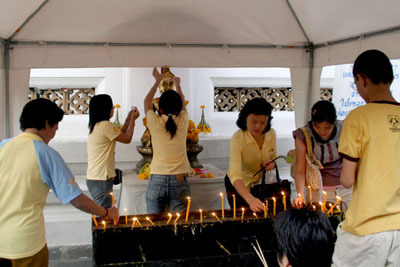 People put gold leaves over the Buddha image. 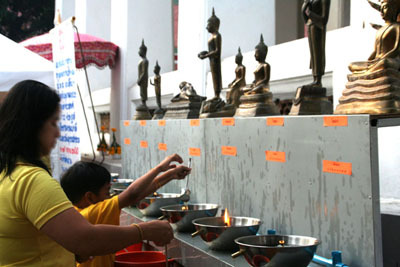 People pray with putting oil for Buddha images of each day of the week. 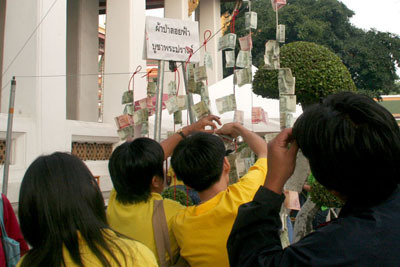 People put bank notes as Tamboon (offering). 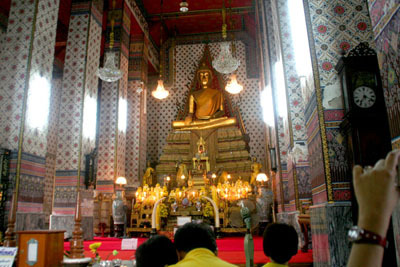 The Buddha image that people pray in Wat Arun. 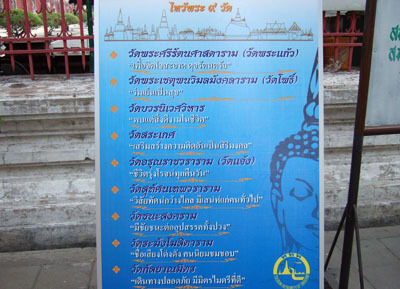 This board shows temples that are recommended to be visited. Looks like the meanings of their names are good and lucky. 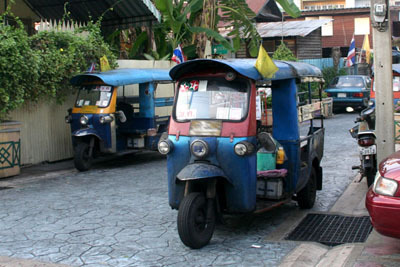 A little special Tuk-tuks are around Wat Arun. 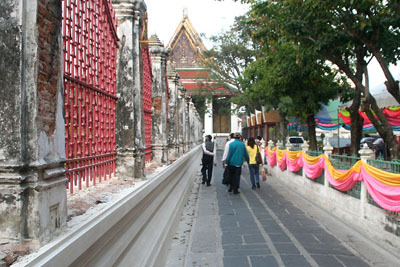 The scenery of a street around Wat Arun. Looks like people park here and visit the temple. "Pra Pathom Chedi", the highest chedi (Buddhist pagoda) not only in Thailand but in the world. 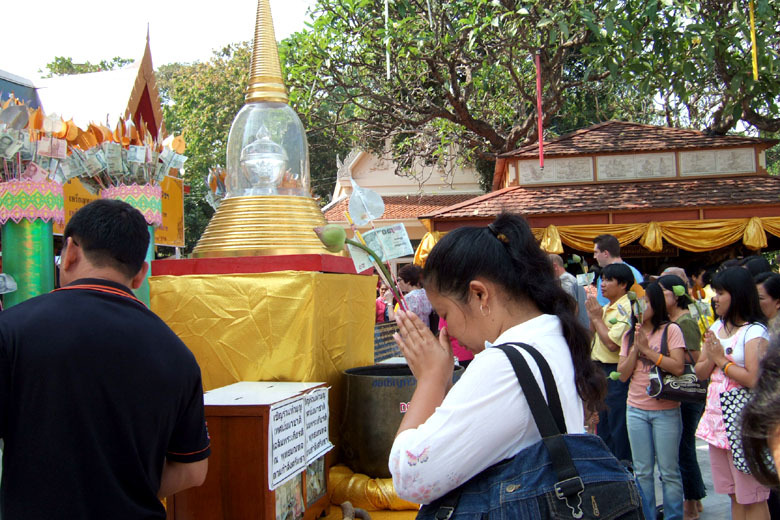 This part shows pictures of Pra Pathom Chedi on New Year's Eve in the end of 2006. 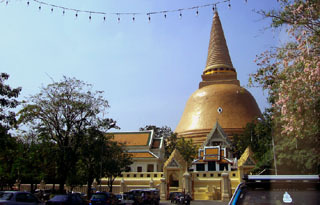 "Pra Pathom Chedi" is one of the main royal temples and located in Nakhon Pathom, about 60 km west of Bangkok. 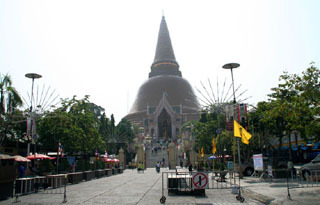 The huge orange tiled chedi is about 120 meters high, 65 meters in diameter and stands on the base, 240 meters around. 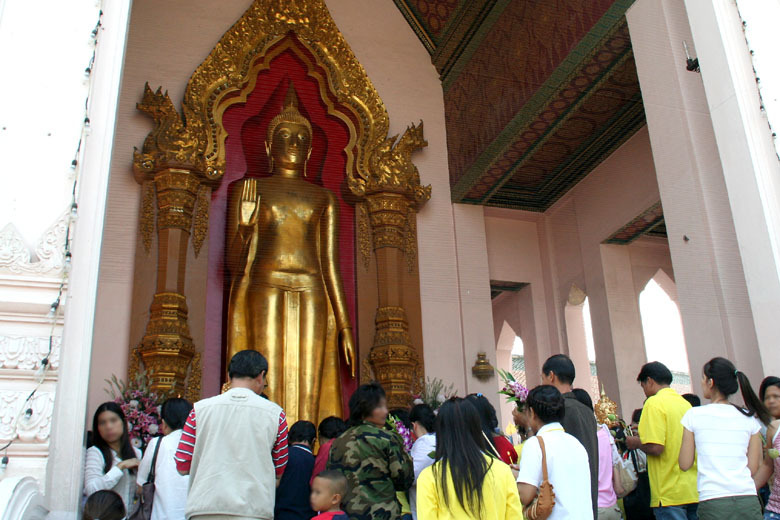 Nakhon Phanom is the place where Buddhism was introduced first in Thailand. 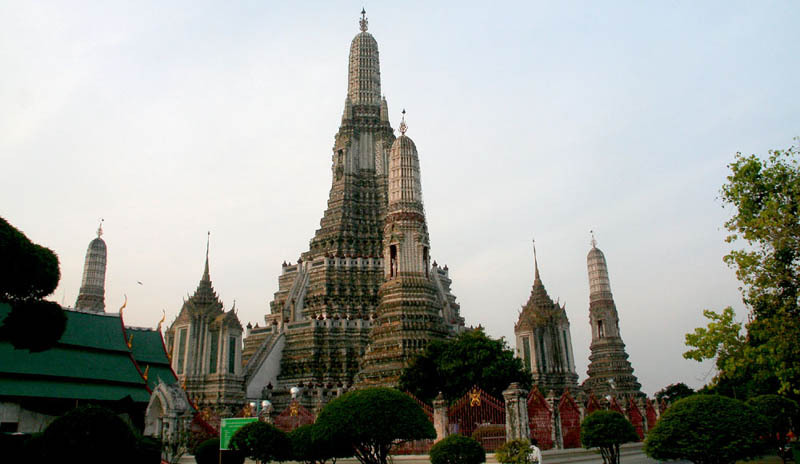 Around the 3rd century B.C., King Asoka sent missionaries here to spread Buddhism and the original chedi was built. 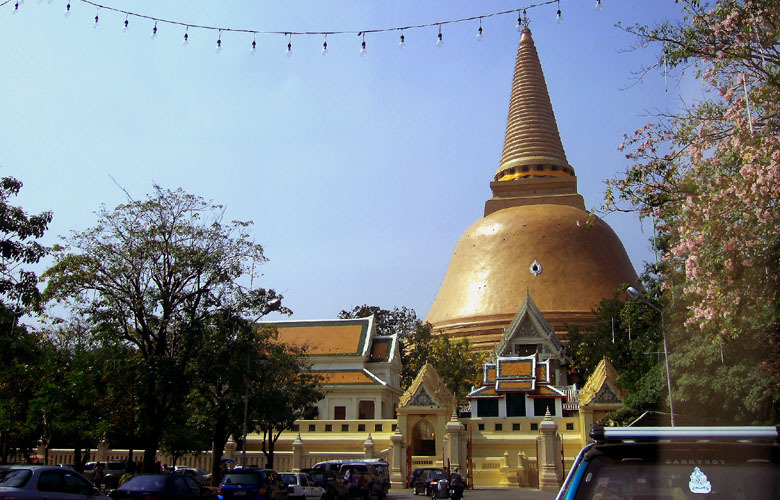 Although the chedi was destroyed by Cambodia in 11th century and left deserted, Rama 4 found it and commanded the reconstruction of a new huge pagoda covering the original one in 1853. 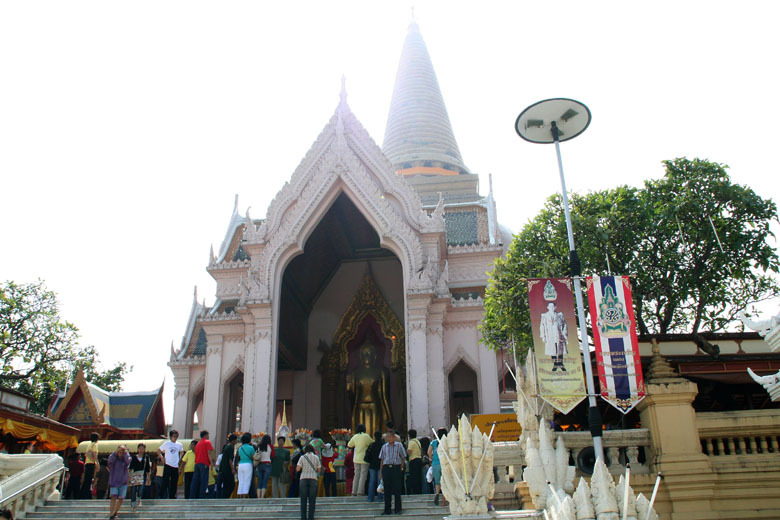 It took about 20 years to finish it until the reign of Rama V.
During the era of King Rama VI, Phra Pathom Chedi was renovated and the temple became the royal temple of King Rama VI. 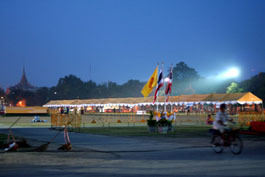 The relics of King Rama VI are housed in its base. 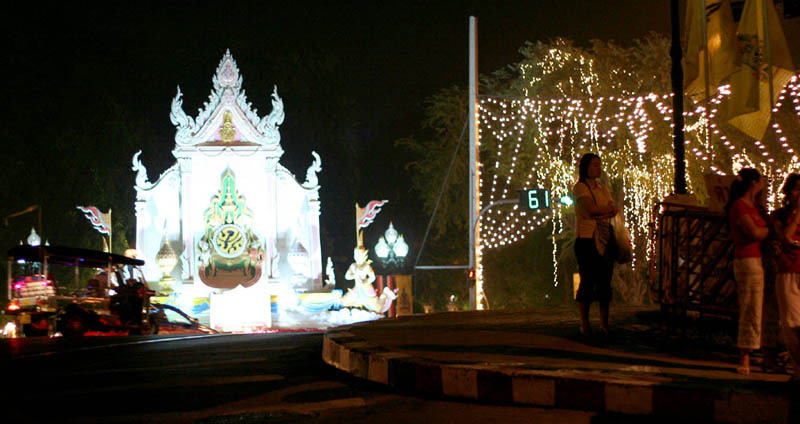 As the birthplace of Thai Buddhism, Nakhon Phanom has a big festival on a night with a full moon in November every year with a lot of people from all over the country. From the front. Very big ! A big Buddha image is at the front of the chedi. A lot of people are praying. A lot of people visit here. Different from in Japan, they pray while putting hands together with offerings. 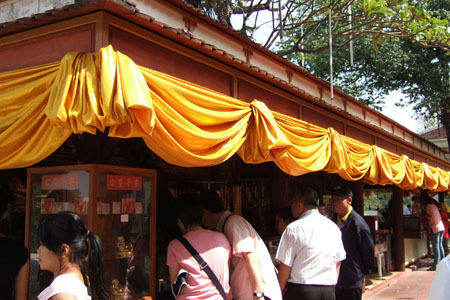 Tables to put Tambun (offerings) for monks when they come out. 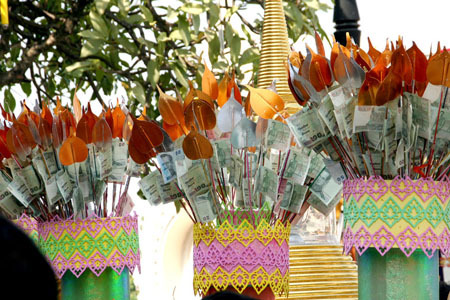 This can be seen in Chiangmai, bank notes offerings. 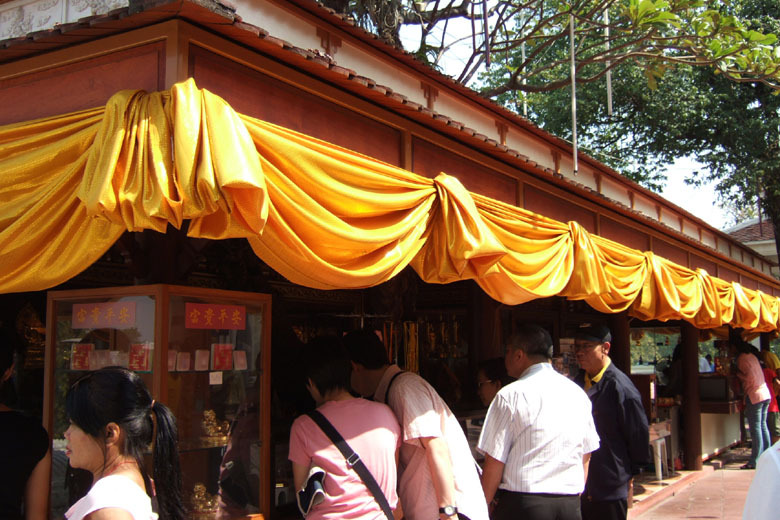 In the site, a shop sells small sized Buddha images to wear. This is a market on new year's eve in Bangkok, Thailand. 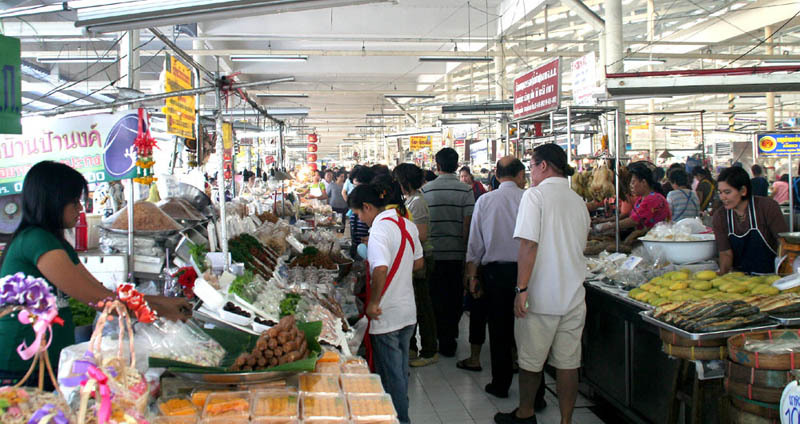 You maybe know the famous market in Bangkok, "Jatujak Market". 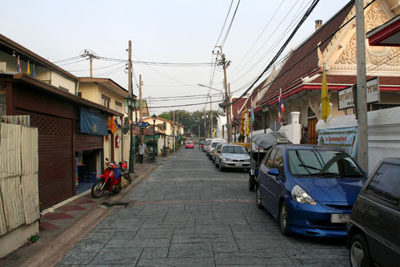 This market shown in the pictures is near the Jatujak Market and called "Or Tor Kor Market". People look busy preparing for New Year's Day as in Japan (the same in your country ?). This was on New Year's Eve in the market. Very crowded with a lot of people in the market. People are busy buying for New Year's the same in Japan. A lot of mangos piled up behind. Fruits gift baskets. A lot of mangos piled up behind. Assorted desserts. Each of desserts has lucky words in their names such as "Thong" meaning "gold". They are food for everyday life such as curry and soup. Taste great !